The Samsung Galaxy Note7 announced in 2nd August 2016 by the Samsung and the flagship phone will be available in the market in this month. This is another most powerful smartphone from Samsung. 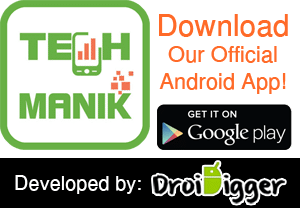 The large size display, high performing processor, 4GB RAM and long battery life make this smartphone perfect for everything. You can easily finish your personal or business tasks smoothly with the Note7. So if you are planning to buy it or already pre-order it, then it’s time to buy some protective case or cover. 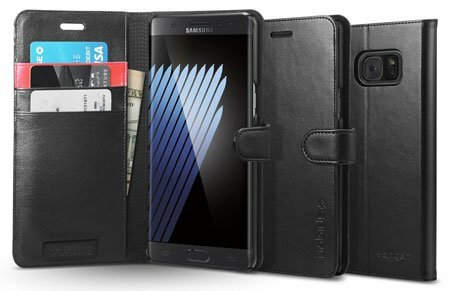 As there are several Samsung Galaxy Note7 cases and covers available now in the market, so I’ve listed them here. All of these cases come from the well-known brand, made of premium quality materials and available in reasonable price. So let’s check my recommended list of best Samsung Galaxy Note7 cases and covers and order your favorite one now. 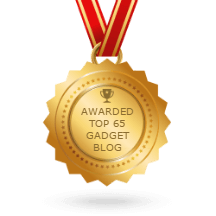 The Spigen is one of the most popular smartphone accessories manufacturer in the world. They are already popular for their other Samsung Smartphone cases like Samsung Galaxy S7, S7 Edge, Note5, etc. The Galaxy Note 7 Case by Spigen is a premium quality rugged armor cases that made of durable and flexible TPU materials. The case specially designed for the Note7, so it will fit on your device perfectly. As the case comes with Air Cushion Technology so that it will protect your Galaxy Note 7 from any kind drop, bumps or physical damage. The soft inner layer also keeps your device safe from scratch. The precious cutouts ensure easy access to all ports, camera, flash, sensor, mic, and button. This premium quality case available in Black color and you can buy it for less than 12USD. 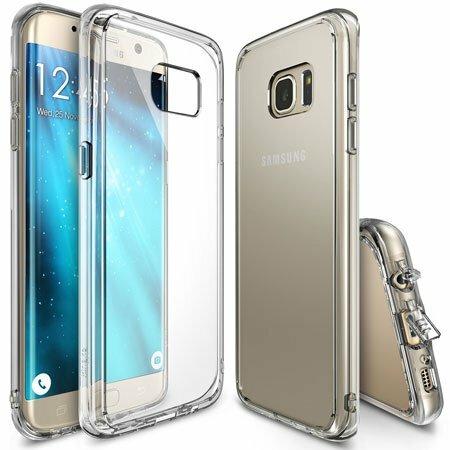 The IVSO is another most popular and well-known smartphone accessories manufacturer and they come with the Samsung Galaxy Note 7 Crystal Clear Bumper Case. If you don’t like to hide your expensive device outlook, then this is the ideal case for you. 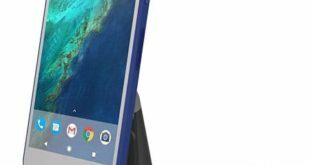 The high-quality TPU material, Shock absorption, and drop protection technology used in this case. So your Note7 will remain safe from scratch, shock and drop or blow damage. The crystal clear TPU bumper case available in 5 different side color and IVSO offer 30 days money back guarantee for this case. Personally, I know some people who don’t like to use a case to protect their phone because of extra bulk and weight. Sometimes, weight is a matter for us. 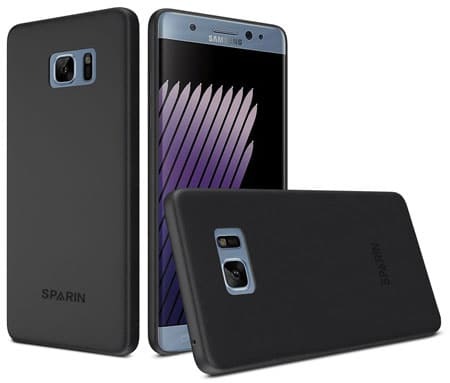 So if you are looking for the best lightweight case for your Galaxy Note7, then the SPARIN [2 PACK] Galaxy Note 7 Case is for you. The case made of high-quality PU and microfiber materials. As the case specially designed for the Galaxy Note7, so its precious cutouts ensure full access to camera, mic, sensor, and button. The ultra slim design case will protect your expensive flagship from any kind damage without adding extra bulk. The SPAIN also offers a lifetime warranty for this case. Another cool and attractive designed case from Spigen. You may know that there are different kind’s wallet style case and covers available in the market. Some wallet case comes with a flip cover, and some come with a kickstand. 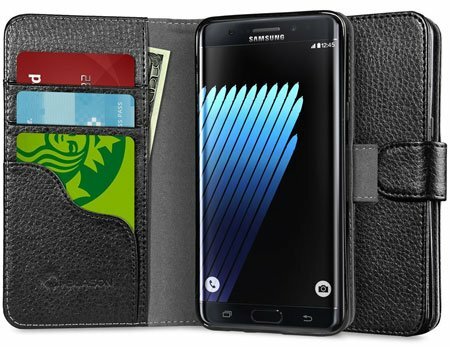 But the Spigen Dual Layer Galaxy Note7 Case comes with a back credit card holder. Now it’s simple to carry your credit/debit card, ID card or some money in your phone case. You can easily store two cards or some money in the card holder section. Like the previous one, this case also comes with air cushion technology to keep your device safe from the blow, drop or scratch damage. The case available in 2 different colors; Black and Gunmetal. The VRS Design is mainly popular for their slim designed smartphone case. They come with the Simply Lite Galaxy Note7 Case with five different colors. The minimalist and premium designed protective case will protect your device from scratch, blow damage and shock. There is a metal kickstand available in this case to watch movies or read your favorite books easily. The TPU materials and polycarbonate materials of this case ensure the highest protection against scratch and shock damage. The brushed metal back design makes this case outlook unique and attractive. 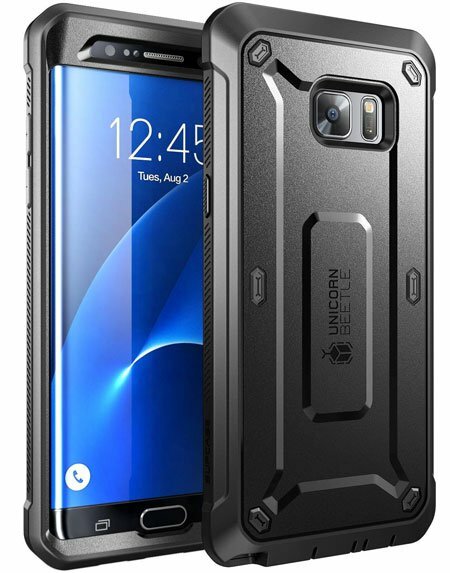 If you are looking for a heavy duty full body rugged holster case for your Note 7, then the SUPCASE Galaxy Note7 Case is the ideal one for you. It is really hard to find a premium quality and heavy duty holster case in the market for specific smartphone model. But the SUPCASE always comes with their attractive holster case for trending smartphones and tablets. The case made of TPU and dual layer PU hard shell. So your phone will remain safe from the high drop or shock damage. The inner layer is soft enough to keep your device safe from scratch. You may already well-known with the Caseology for their best-selling smartphone cases and covers. They are mainly popular for the lowest price, but premium quality cases. The Caseology Galaxy Note7 Case made of premium quality PU leather material and available in 5 different colors. The soft touching PU leather ensures maximum comfort when you operate the smartphone. 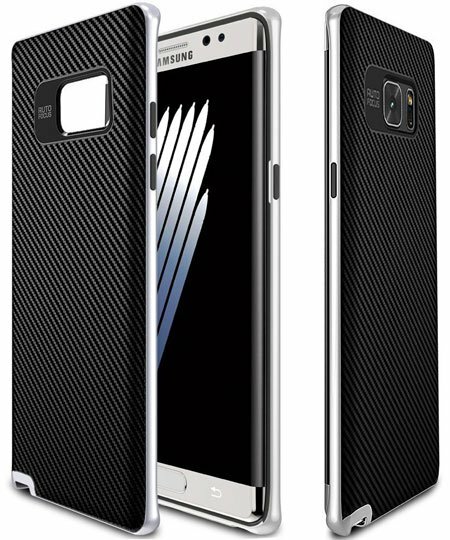 And the TPU case with polycarbonate bumper keep your Galaxy Note7 safe from scratch or blow damage. 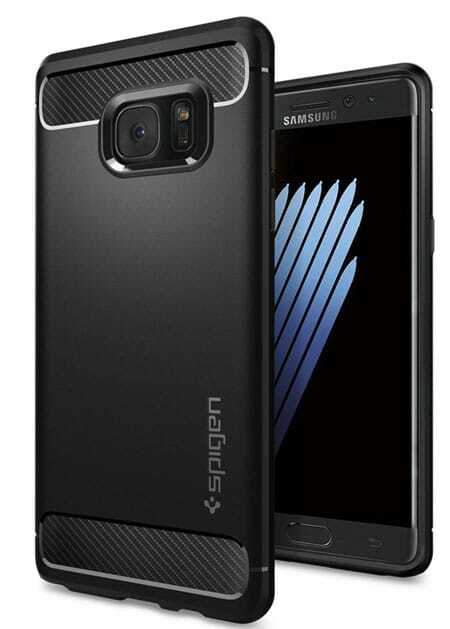 Another premium quality note 7 cases from Caseology and this case from Wavelength Series. Like the Envoy Series, this case also available in 5 different colors. And the price is less than the Envoy series. The smooth texture and comfortable grip make this case perfect for operating your device in one hand. The precious cutouts also ensure easy access to all button, headphone jack, mic, camera, and flash. 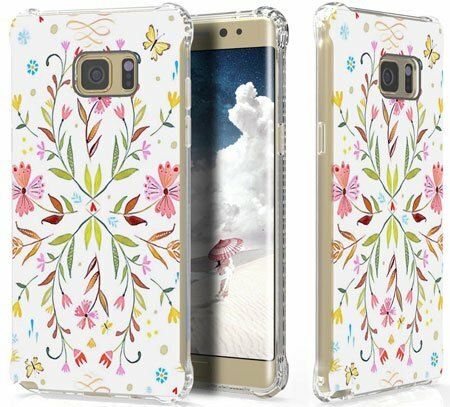 My younger sister always loves to use a white color or awesome colorful designed back cover case to protect her smartphone. Personally, I also know some women who like to use a colorful case to protect their phone or tab. So if you are also one of them and looking for a colorful designed case, then the Galaxy Note7 Case by FYY is the ideal one. The cover available in 4 different colorful designs and made of durable and flexible TPU material. 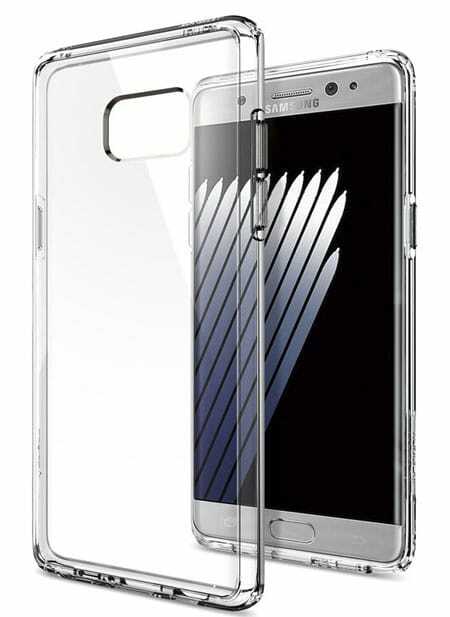 The only one military grade drop certified transparent bumper case cover for Samsung Note 7 in the market. The case also comes with Spigen and available in 4 different transparent colors. The crystal clear case is perfect for the people who don’t like to hide their expensive phone outlook. The ultra-hybrid case also comes with air cushion technology to ensure maximum protection against drop or blow damage. The Ringke also a popular brand for Smartphone and tablet cases and accessories. They come with a premium quality but cheap price Slim fit case for Galaxy Note 7. This ultra slim and stylish design case will protect your device without adding extra bulk. Highly durable PC materials used in this case. The sung fit feature will protect your Note 7 from finger spot, scratch or drop damage. The case is available in 7 different colors. The Myriann Bumper Case for Galaxy Note 7 is one of the top rated Samsung Galaxy Note 7 case on Amazon. The case available in 3 different colors; Silver, Gold, and Navy Blue. The high-quality TPU and PC material used in the case to ensure maximum protection against dumping, scratch or any kind physical damage. 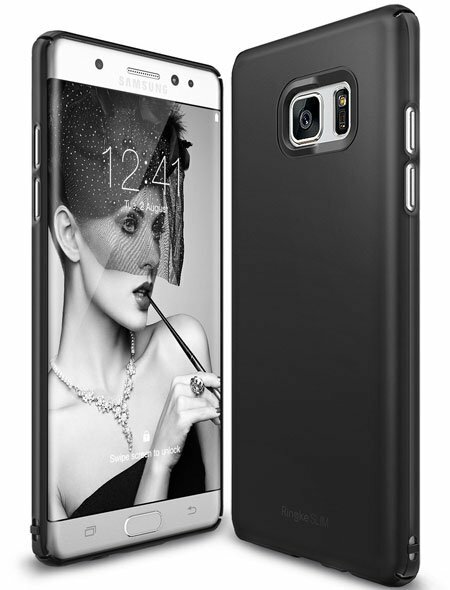 As the case specially designed for Note 7, so it will fit perfectly, and you can access all ports and buttons easily. Another case from Ringke for the Samsung Note 7. 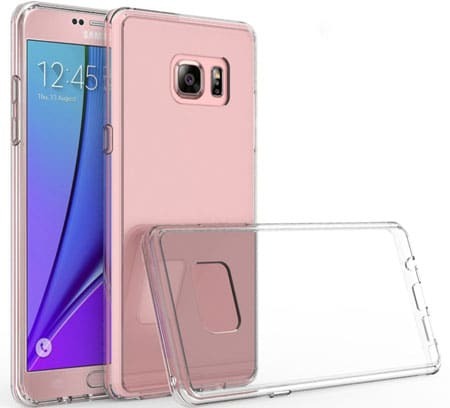 This is a crystal clear bumper cover case that will protect your Note 7 from any kind damage without hiding the outlook of your device. This transparent bumper case available in multiple colors to make your device stylish. 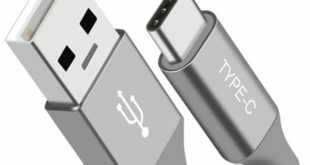 The most attractive feature of this case is, it comes with the Attached Dust Caps which will keep your device charging port and headphone port dust free. Most of the women like to use a wallet style folio case cover to keep their smartphone safe from scratch, shock or drop damage. The E LV Galaxy Note 7 Purse Wallet Case Cover came with six different colors and made of premium quality PU leather material. The wallet case cover specially designed for the Samsung Note7, so your device fits perfectly into this case. There is a zippered sleeve available in this case with card slot and a money slot. You can store up to 3 cards, some money and other essential small documents in this zippered sleeve. 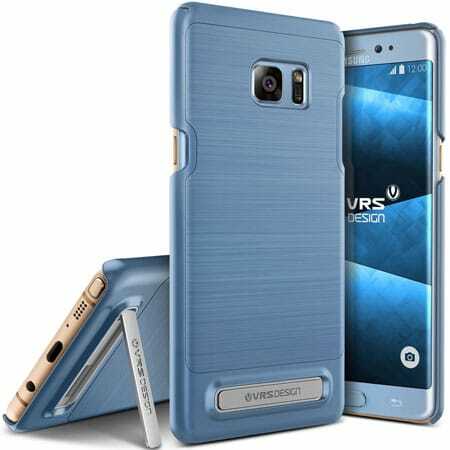 A premium quality and luxuries Leather Folio Case Cover for Note7 by VRS Design. 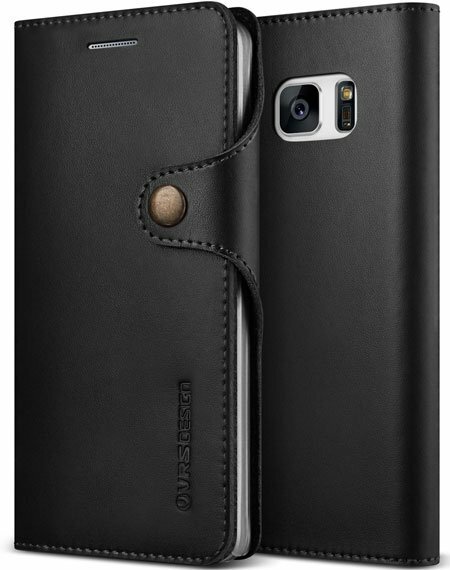 The cover made of genuine leather and designed for both men and women. The all-around protection technology keeps your device safe from any kind damage. There are three card holder slot and one money slot available in this leather cover. The leather wallet coves available in Black, Red and Brown Color. 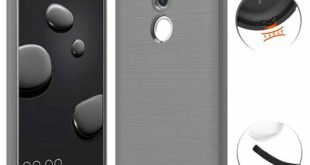 As you know that, Spigen is one of the well-known smartphone case manufacturers in the market. They come with multi-purpose Galaxy Note7 Wallet style case. The premium case protects your smartphone from scratch and damage as well as you can use it as a wallet. The wallet case comes with three credit/debit card holder slot and one money holder slot. The built-in kickstand makes this case perfect for watching movies or reading books. The high-quality magnetic strap open and close the case cover securely. 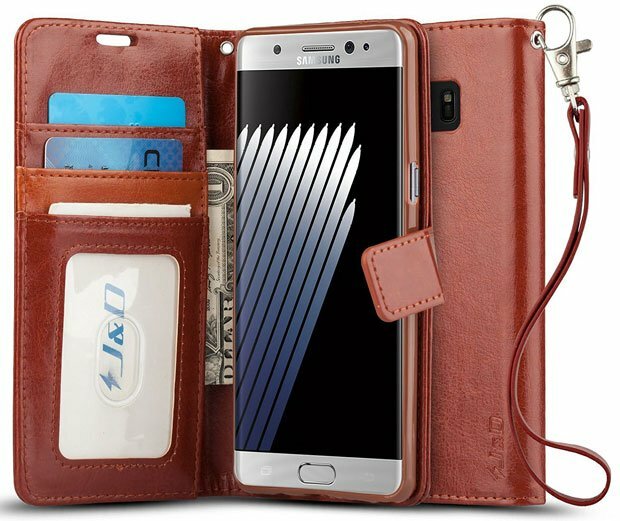 The Galaxy Note 7 Wallet case by i-Balson is a beautiful and premium quality leather cover case in the market. The slim cover specially designed for the Note7 to protect it from scratch or blow damage. The premium quality synthetic leather and no-scratch inner materials keep your device from both external and internal damage. There are several internal slots available in this wallet case to store your ID card, credit card, and money. 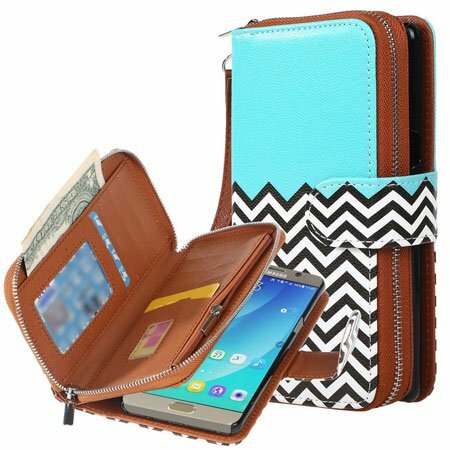 Looking for a beautiful and stylish designed wallet style cover case to protect your note7? Well, the FYY comes with a handmade and beautiful designed cover case with wallet function. The case is available in more than 20 different colors and design. Several internal slots are available in this case to hold a credit card, ID card, and money. 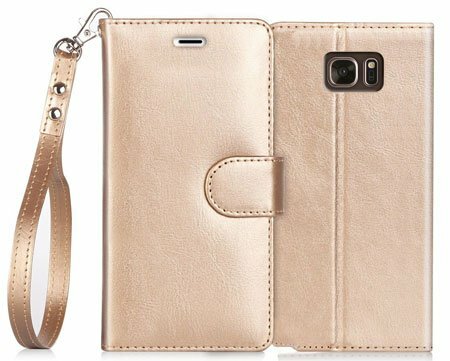 A premium quality flip leather wallet case from J&D for the Galaxy Note 7. The case made of high quality synthetic PU leather and shock-absorbing rubberized TPU materials. So it will protect your device from shock, drop down or any kind physical damage. Like most nother Wallet cases, this one also comes with three card slots and one money slots. This wallet case cover available in 6 different colors. 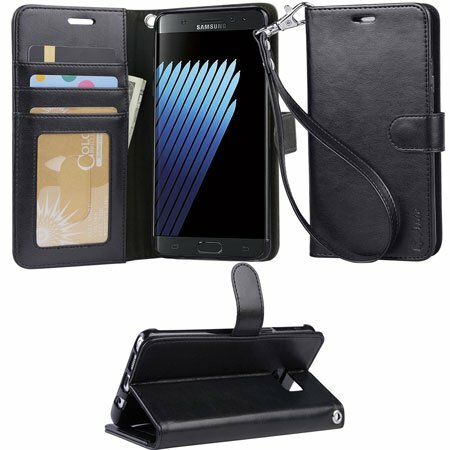 The ARAE Samsung Galaxy Note 7 wallet Case with Kickstand is a slim wallet folio case that also made of high-quality synthetic leather. The built-in kickstand helps to access your device screen horizontally. The precious cutouts ensure easy access to all ports and buttons. The stylish wallet case available in 10 different colors. So these are my recommended best Samsung Galaxy Note7 Cases and Covers and all of these cases & covers available now in the market. If you don’t find your favorite one in this list, you can Visit Here to Find More Galaxy Note 7 Cases and Covers.